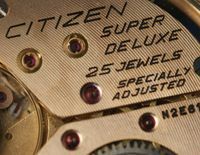 The very early 1970s marked what was probably the peak of Citizen’s mechanical watch production, and their ‘Leopard’ line offered a range of quality models, all high beat, and (for mechanicals) capable of very accurate time-keeping. Often marked ‘superbeat’ the Leopards ran at either 28,800 beats per hour, with 22, 24 or 26 jewels, or at 36,000 beats per hour with 28, 31 or 32 jewels. 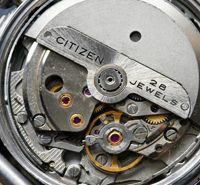 At the top of the Leopard tree is the Chronometer, tuned to Citizen’s ‘official’ certification, with a 36,000 bph movement of course and initially with 28 jewels. I’ve also seen examples with either 31 or 32 jewels, which may have been sold in export markets rather than in Japan. 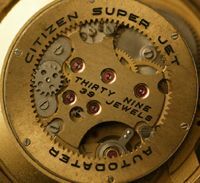 The medallion is not perfect, and although hard to see, there is a spot on the dial. The seller of this one also described some sort of auto winding problem, so I got this one cheaply (for one of these!). 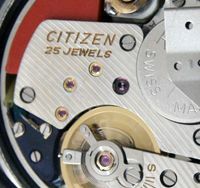 I’m holding back on movement shots in this post because my Chronometer has been to see Brian aka 31 Jewels for a full service and to resolve the problem – and it was a significant one! His work on it will be featured later on his restoration pages. 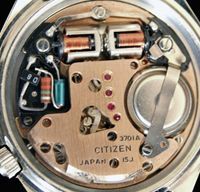 This entry was posted in Vintage Watches and tagged Citizen Leopard, Citizen Leopard Chronometer, Vintage Citizen High Beat, Vintage Citizen Watches, Vintage High Beat Chronometer. Bookmark the permalink. What a beauty! Would be a pleasure to own one… :D. I wonder what that serial number actually means? Is it really so, that these have been made over 20.000 pieces in that particular year and month ???? If it is so, then the overall production have been quite many pieces? i was about to write a comment to your last post,#72 Super Deluxe, but i´m such a busy now, so i´ll do it later! Stephen, could it be so, that when there is 20.000+ or 30.000+, etc., with a rarer models, it means, that the actual production number or amount is that last numbering, 873 in your watch ? It makes some sense, because those models were certainly very expensive compared to some more casual models…??? So, if there was a production of like 1000-2000 per month, it´s a reasonable amount, methinks ? :D.
Quite interesting watch! I didn´t bid it, `cause i had no such a money at that moment… Defenitely worth of buying! And look at that serial number, i would say, that this kind of watch have been made a very limited period, say a month or two??? So, there might be a limited edition of 4-5.000 pieces? Hi Marko – makes sense to me regarding the serials. Would be good to know for certain! Stephen, Excellent post and beatiful watch. I would also like to own own one of these some day. Hi Mikko – thanks. Hope you can find one! wish to know if GN 3-5 4-740041Y uses the same case as GN3-5 4 720261Y. They are both high beat chronometer. Thanks. Hi Ronald – thanks for visiting my blog. A different case number would normally suggest that the cases are different, although these two look very much alike. One supplier lists two different part numbers for the crystals which also suggests they may have slight differences. Lovely watch Stephen. Is that a linen dial that I spy? Nice, but simpler gold medallion compared to the Chrono Master as well. I’d describe the dial as being finely brushed in one direction – so not quite a linen finish I guess. The medallion is unique to this model, so is interesting for that alone.